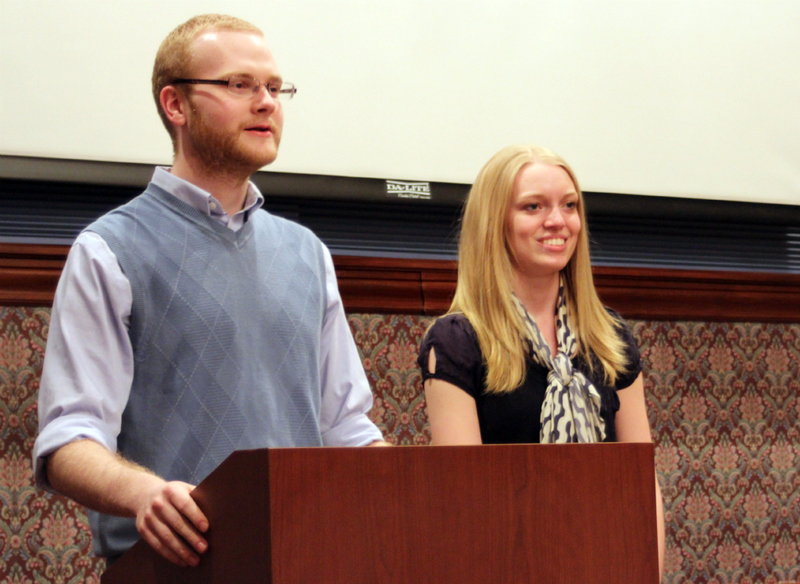 Student Senate presidential elections will once again not be much of a battle. For the second year in a row, senior Bible and theology major Bob Book was the only candidate for president. On Monday, Feb. 20, Book and his running mate, junior chemistry major Brandi Bonfert, were questioned in what has traditionally been a debate. For the second year in a row, there were no other candidates and the debate was transformed into a question and answer time for students and Senate members to ask questions of the candidates. There were two non-senate students at the debate. This and the lack of candidates in this election reflect a greater problem within the student body, according to Book. “It creates a greater challenge that we don’t have any opposition because we have to work even harder to communicate to the student body what’s going on now,” Book said. Bonfert has been a member of student senate and Book has been president for the 2011-2012 school year. The candidates stated their platforms that included two major aspects. Book and Bonfert, who have been campaigning as B4, said they desire to be president and vice president in order to maintain consistency and initiate collaboration of campus groups and students. “It would have been more fun if we had competition,” Bonfert said. One of the ideas proposed by the candidates to strengthen community within the campus and the community the plan to propose to Student Development. They came up with the idea to have a Christmas Walk next year with themes for every dorm to decorate their halls, like in what is now the Havi-walk. They plan to have as many groups on campus collaborate in this event and open it up to children and the community in order to lead up to the events of Christmas at Malone. Another proposition Book and Bonfert plan to implement is the resurrection of the Service Committee. This committee served on senate for the sole purpose of bringing service opportunities to students. They also hope to incorporate a program called Spring Into the Streets, which would be for all students and would mirror the Into the Streets program for freshmen. “It would be a great opportunity for Malone as a community and also for us to work together with Canton,” Bonfert said. Elections are to be held Tuesday, Feb. 21 in the Great Hall. Students can vote on one of five iPads. This makes the calculations process almost instantaneous, and results will be announced on TheAviso.org as soon as possible. Chelsea Weikart is managing/news editor for The Aviso AVW.